This Stanley London® Solid Brass Luminescent Hiking Compass is an accurate and reliable night-reading open faced compass that easily fits in your pocket or around your neck. This Hiking Compass is a perfect orienteering compass for hikers and backpackers. The compass features an easy-to-read compass rose and has a quick and responsive air-damped compass needle that settles quickly to north. The Luminescent Hiking Compass has a needle lift mechanism to protect the compass's jeweled bearing when being transported. Moving the needle lift lever activates the needle lift mechanism to lock the needle and protect the jewel. The North end of the compass needle has a luminescent dot that glows in the dark for easy nighttime reading. 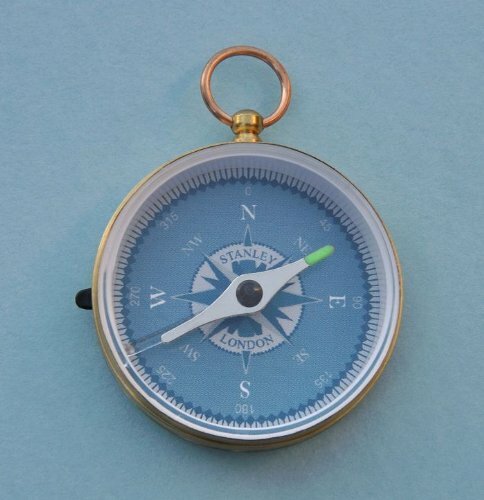 The Hiking Compass is made of solid brass which will not rust. The compass measures 1 13/16 inches (4.6 cm) in diameter and is 0.46 inch (12 mm) thick. This Hiking Compass weighs only 0.86 ounces (24 grams).